Protecting ancient ruins—and the night sky. Above: The night sky night at the Salinas Pueblo Missions National Monument. Photograph by Jake Werth. At dusk on a cool spring evening, the National Park Service and volunteers from the Albuquerque Astronomical Society, including Martin Hilario, prepare for a night of stargazing at the Salinas Pueblo Missions National Monument. Several years ago, the International Dark Sky Association designated the central New Mexico monument as an International Dark Sky Park. Salinas now hosts dark-sky events at its three archaeological sites—Abó, Gran Quivira, and Quarai. At Abó, rangers lead visitors on a 30-minute hike to nearby cliffs where Native people etched their images in the red sandstone. They survived the harsh desert environment and mined salt from nearby flats—las salinas—for subsistence and trade, giving the area its Spanish name. Shortly after the Spanish arrived, in the 17th century, the residents abandoned Las Salinas because of drought, disease, and raids from nomadic tribes, moving west to live with the people of the Río Grande. The Gran Quivira site has the greatest view of the sky—one that’s very similar to the night sky of centuries past. Special red lighting illuminates the ground, allowing your eyes to adjust to the darkness. Stars, planets, and the Milky Way shine brilliantly. As light pollution grows, the need to protect dark skies increases. 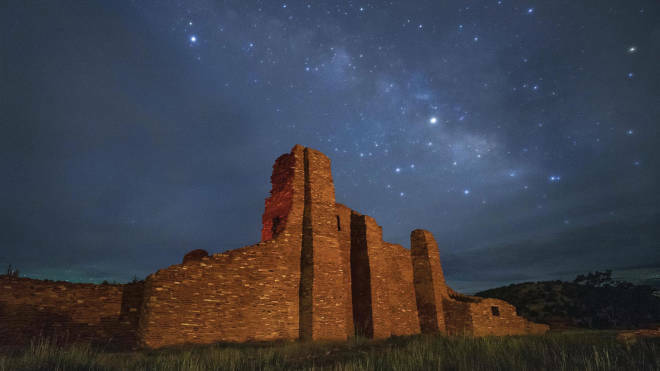 Salinas Pueblo Missions preserves the dark sky and protects important ancient sites, so you can stand among the ruins and marvel at the heavens with the spirits of the ancient ones beside you.